Start your engines and set off on a photo safari! Children embark on a fascinating mission to find and photograph Canadian species at risk. This simulation lets children drive a truck through every province and territory and up to 79 communities in search of animals. Driving safely and staying healthy along the way is very important for a successful journey. Vivid 3-D graphics create a real-life environment and make learning fun! The Animal-City Chart lets you search by animal name and learn where the 50 animals in the game can be found. The City-Animal Chart lets you search by city name and find out which animals live near each city. You can view and print these PDF files with the free Adobe Reader software. 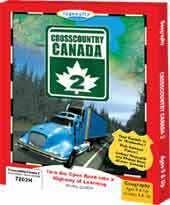 Teacher's guide and wall map of Canada included with all school versions! Ingenuity Works has a special arrangement that offers reduced prices on home versions of our most popular CD-ROM titles. For more information, click here or call Ingenuity Works at 1-800-665-0667 and ask about the Student Take-Home Program. We also offer exceptional pricing for Site License holders who wish to upgrade to a newer version of any of our products. Please call 1-800-665-0667 for more information. Copyright(c)2016 C3 Media Inc. dba Ingenuity Works. All Rights Reserved(c3-web1.cozaq.com).